In July of 2008, we found ourselves traveling along Yankee Fork Road for an Idaho ghost town adventure. Traveling up Yankee Fork Road, the sides of the trail are piled with rocks from the dredging operation, but, the river still provides numerous recreation opportunities. Kathy Weiser-Alexander, July 2008. Around 1866, a group of Montana prospectors led by Joel Richardson came to what would become known as the North Fork area searching for placer mining opportunities. When they came to a large tributary of the upper Salmon River, they set up camp and prospected for several weeks, but unfortunately did not find gold. However, before returning to Montana, they named the creek “Yankee Fork,” because everyone in the party was a Yankee. Prospectors continued to comb the area and in 1870 gold was found on a tributary of the Yankee Fork near Jordon Creek. 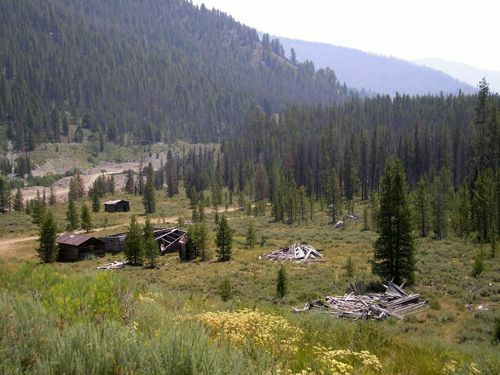 Soon after the discovery, the Yankee Fork Mining District was organized. The first significant find was made by William Norton in July 1875, which produced as much as $20,000 in ore dug by hand by Norton and his partner, John Rohrer. After the discovery of the General Custer Mine in August 1876 by James Baxter, E. K. Dodge and Morton McKeim, the area really began to flood with miners. The three founding members of the mine; however, realized they didn’t have the resources to develop the mine and soon sold out to an English firm. Bonanza today just has a few tumbling buildings, Kathy Weiser-Alexander, July 2008. Click for prints & products. With prospectors camped out all over the area, the town of Bonanza City was laid out in 1877 by a man named Charles Franklin, some eight miles up the Yankee Fork of the Salmon River. Generally just called Bonanza, which is Spanish for “prosperity,” lots were first sold which ranged from $40 to $300. In the beginning, machinery and supplies had to be brought in by mule packers along a rugged 84-mile trail from Ketchum. The settlements first buildings were crude log buildings that were gradually improved over time. The miners celebrated when the first saloon was built and soon sawmills were constructed, more miners poured into the area, and plans were made to build a toll road between Challis and Bonanza in 1879. Once it was complete, freight haulers required 5-7 pairs of oxen, mules, or horses to pull their loads on trips that would take four days to cover the 35-mile wagon trail. The following year, a daily stage was running over the toll road which cost passengers $5.00 for the 8-9 hour one-way trip. Though Bonanza never had a mine or a mill, it quickly became the hub of the area and by 1881 it boasted some 600 people and numerous businesses including Custer County’s first newspaper, The Yankee Fork Herald; a post office, a school, the Dodge Hotel, a blacksmith, a cafe and dance hall called the Charles Franklin House, a hardware store, grocery and variety stores, a dentist, a watchmaker and several other businesses. The settlement also sported numerous entertainment venues including a croquet field, a baseball field, and a small racetrack. Bonanza’s wide main street was lined with trees and several two-story buildings fronted by boardwalks or wooden sidewalks so customers wouldn’t have to walk through the mud or the snow. The town also sported a public well and a water system, which provided water for its residents as well as fire protection. In the meantime, Custer City had also sprung up about two miles upstream from Bonanza, though, at the time of Bonanza’s peak in 1881, the town outnumbered Custer City two-to-one in population and sported a greater number of businesses. 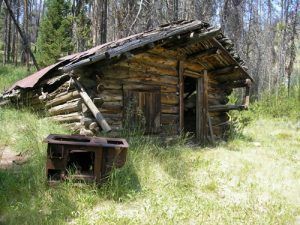 The old iron stoves always seem to sit outside these old miner’s cabins, Kathy Weiser-Alexander, July 2008. Bonanza suffered its first setback when a fire raged through the town in 1889; however, it continued to survive until a second fire destroyed an entire block in May 1897, and most of the remaining merchants moved to nearby Custer instead of rebuilding. By this time, the waterworks had fallen into disrepair and firefighters were unable to save the buildings. By the turn of the century, Bonanza’s only remaining businesses were a boarding house, a saloon, a slaughterhouse, a few stables, and several cabins, as most all its population had either moved out of the area or moved upstream to nearby Custer. Today, Bonanza has only about seven tumbling structures, in various states of decay. A Forest Service Guard Station, built by the Work Progress Administration in the 1930s, is located on a hill above the old townsite, which is responsible for the care and maintenance of all the recreation facilities in the area. Traveling westward up the hill and beyond the guard station are two cemeteries, the first of which served both the people of Bonanza and Custer and the other, a bit further down the road and referred to as Boothill, holds only three marked graves. 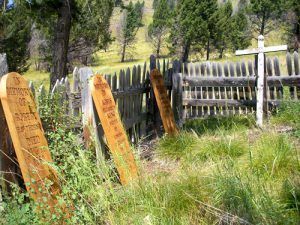 The story of these three unmarked graves remains a bit of a mystery, but what is known is that a couple by the name of Richard and Agnes Elizabeth “Lizzie” King, both natives of London, England, moved into Bonanza from Bodie, California in the summer of 1878. The pair soon set up businesses, with Richard selling real estate and Lizzie, who was described as a “golden-haired beauty” opening the Arcade Billiard Saloon and the Yankee Fork Dance Hall. The couple became good friends Bonanza’s founder, Charles Franklin, who owned The Franklin House. However, it was Lizzie that tended to spend the most time with Franklin, most often without her husband. In the meantime, Richard and his real estate partner, by the name of William Dillon, weren’t getting along and dissolved the partnership. A short time later, when Dillon allegedly sold some land that belonged to King, an argument erupted and Dillon shot and killed him on July 14, 1879. Dillon wound up being sent to prison for 10 years, and Lizzie was picking out a burial plot for her husband. Charles Franklin, who, by this time had become infatuated with Lizzie, was right at her side, helping her to pick out a site on the hillside that had been recently been designated as Bonanza’s new cemetery. Richard King was to be its first occupant. Bonanza Boot Hill. Click for prints & products. Franklin, who had hopes of winning Lizzie for himself, also bought two more plots, one for himself, and one for Lizzie. Almost immediately after her husband was buried, Franklin began to openly court Lizzie and rumors abounded that they would soon marry. However, Franklin’s plans were foiled when another man by the name of Robert Hawthorne came to town and went to work for Lizzie as a dealer in her saloon. Evidently, he swept the beautiful blonde off her feet, because the two married on August 11, 1880. Just six days later, Robert Hawthorne and Agnes Elizabeth “Lizzie” King Hawthorne were found dead in their home. Charles Franklin buried the newlyweds next to Richard King, and interestingly, did not include her married name on her marker, and instead of putting the date she died on the marker, put on both her’s and Hawthorne’s grave markers, the date of their marriage. Though suspensions were high that Franklin had killed the pair, he was never arrested. 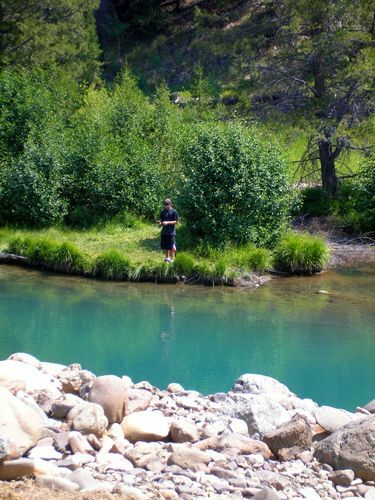 A short time later, Franklin packed up his belongings and moved to a placer claim near Stanley. A few years later, he was found dead in his lonely cabin, clutching Lizzie’s photo in a gold locket. His body was buried next to his cabin, miles away from the tiny cemetery where his love, Lizzie, lay between her two husbands.